School-Live!, also known as Gakkou Gurashi!, is a simultaneously heartwarming and terrifying story of friendship and survival. Behind the barricades of a self-sustainable school, Yuki, Kurumi, Yuuri, Miki, Megu-nee, and the club puppy, Taroumaru, try to live a normal life, despite the reality occurring just outside the school. Have you ever wondered what your zombie survival style is? Take this quiz and find out! When you’re done, don’t forget to share your quiz result on Facebook, Twitter, Tumblr, or Google+! Watch School-Live! on Hulu Today! With mystery and moe, surprises and suspense, this slice-of-life-comedy-horror-anime takes you on a wild emotional ride that proves there’s more to life than simply survival. The entire series is now available on the Sentai Filmworks Hulu channel. 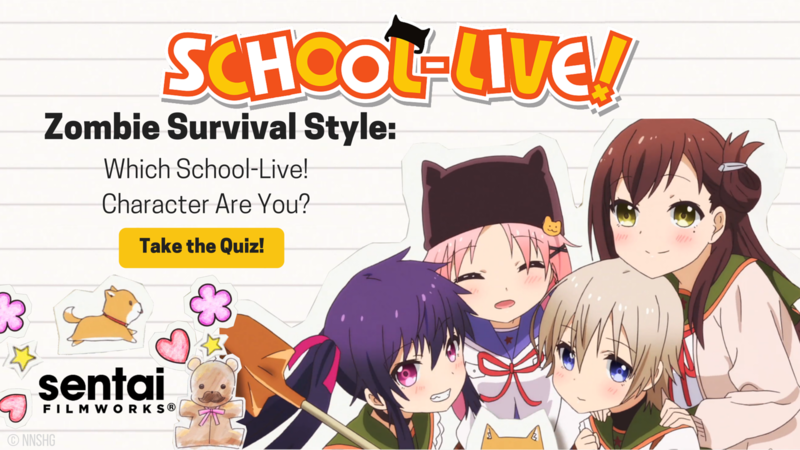 Watch complete episodes of School-Live! and share you reactions of the show with us on our social channels!